OSPAR has assessed the occurrence of marine litter in all regions within its Maritime Area, except for the Wider Atlantic where there is poor data availability. 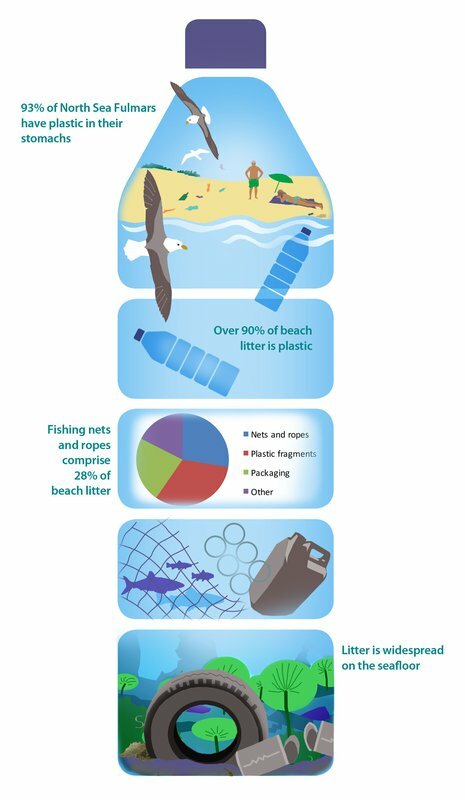 Marine litter, in particular plastic, is abundant on beaches, in the water column and on the seafloor. Marine litter also affects biota, as indicated by the levels in North Sea fulmar stomachs. The amount of marine plastics being ingested by this seabird species indicates that floating litter in the OSPAR Maritime Area is not decreasing. In addition, OSPAR’s first assessment of seabed litter has shown that litter is widespread on the seafloor across the area assessed, with plastic the predominant material encountered. There has been no significant change in the amount of plastic recorded on beaches or in fulmar stomachs over the past 10 years. The goal, as stated in the OSPAR Strategy, has therefore not yet been achieved. The OSPAR Quality Status Report 2010 reported extensive litter problems. OSPAR has since extended marine litter monitoring within its Maritime Area in line with the OSPAR Strategy. OSPAR’s 2014 Regional Action Plan for the Prevention and Management of Marine Litter in the North-East Atlantic sets out the policy context for OSPAR’s work on marine litter. It also describes the various types of action that OSPAR will undertake over the coming years, and provides a timetable to guide the achievement of these actions. OSPAR’s strategic objective is to substantially reduce marine litter in the OSPAR Maritime Area to levels where properties and quantities of marine litter do not cause harm to the coastal and marine environment.